The aim of this post is to explain how to convert voltage from Sharp ranging sensor into an accurate distance. 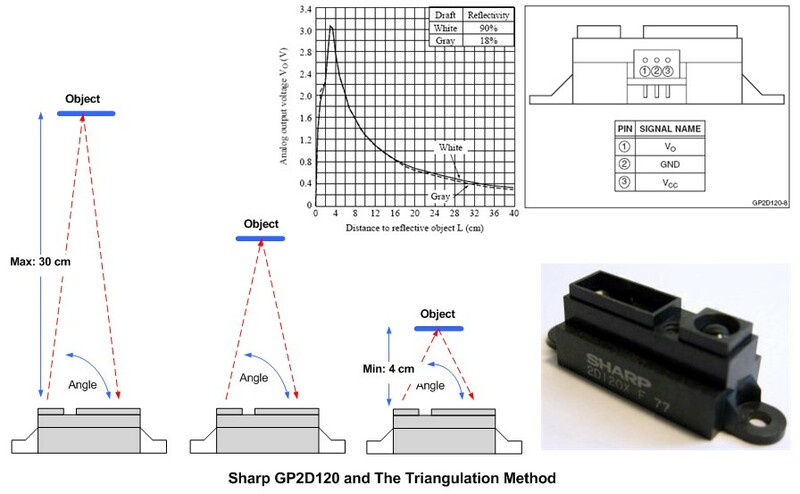 Experiments have been performed with Sharp GP2Y0A21YK distance sensors. The range of this triangulation-based sensors is from 10cm to 80cm. An accurate measurement experimental campaign has been performed. Range has been measured with a step of 10mm. The following graph show the behavior of the GP2Y0A21YK sensor according to the distance (ADC value vs distance). As it is explained in the sensor’s specifications the sensor is not suited for measurements below 10cm due to ambiguity. The approximation for the GP2Y0A21YK is given by the following equation. \(ADC\) is the raw value returned by the Arduino analogRead() function in range from 0 to 1024 (10 bits analog to digital converter).